Although there are variations between individuals regarding growth and development – for example certain persons can be precocious and others may be slower to develop – the age between 11 and 13 is on average a period where the final dentition is almost complete, but where there is still a potential for growth that can be essential for the correction of certain imbalances affecting the jaws. At this stage, where all final teeth are present, we will mainly work on correcting a faulty dental alignment if the patient doesn’t have any gaps between his jaws, or if a first stage of treatment using an aligner has already been started. For simple alignment corrections we will use removable devices (for moving a maximum of 2 or 3 teeth). § For more important corrections, the treatments with multi-attachments are more usual at that age. We glue a bracket on each tooth and a semi-rigid arch is inserted into the brackets. 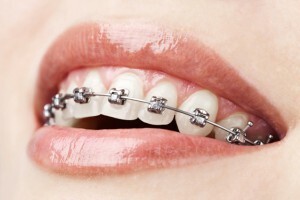 It is fixed by a plastic or metal ligature which will allow to guide the movement of the teeth. The brackets are glued on the exterior side of the teeth (transparent brackets for superior buckteeth and metal for the other teeth). Metal brackets available at Doctore Lebahar’s Practice in Thonon-les Bains. Invisible treatment with aligners is also an option more and more used by adolescents. Invisible Invisalign Aligners available at Dr Lebahar’s Practice in Thonon-les-Bains.